Over the weekend, I received an e-mail message from a landowner in southwest Ohio asking what could be stripping bark from the branches of a large thornless honeylocust on their property. Their pictures showed long slivers of bark were being removed from branches that were clearly much too high to be within reach of other possible bark strippers such as deer. To my knowledge, we do not have porcupines in my part of the state which leaves squirrels as the most likely culprits. Squirrels can injure trees in two ways: by stripping bark and lopping off twig tips. The twig pruning causes no real damage with the result mimicking tip-pruning done to increase canopy density. However, debarking by squirrels can potentially girdle trees particularly since these arboreal mischief-makers often focus their bark stripping on a single tree while ignoring nearby trees of the same species. Indeed, the landowner noted that only one tree was being affected. I observed the same thing last year during a site visit to a landscape in northern Kentucky with Dr. Mike Klahr (Extension Agent, Retired; Boone County Cooperative Extension). The debarking damage was focused on a single tree; we found no damage on other trees on the property as well as on trees in neighboring properties. I took these pictures during that site visit. Bark stripping has been linked to several squirrel species in North America including eastern gray (Sciurus carolinensis) and fox (S. niger) squirrels as well as two so-called pine squirrels; the red squirrel (Tamiasciurus hudsonicus) and Douglas pine squirrel (T. douglasii). 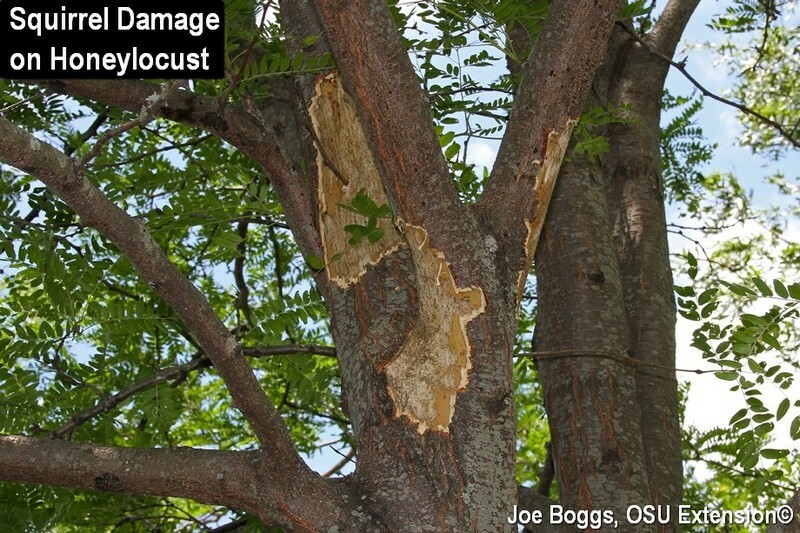 Gray squirrels target a wide range of deciduous trees although the past damage I’ve observed in Greater Cincinnati has primarily occurred on American beech, honeylocust, and maples. As with other areas of the country, bark stripping usually occurs in our region from April through early July. Thankfully, bark stripping by squirrels remains somewhat rare in North America. This is not the case in the United Kingdom (UK). Eastern gray squirrels were introduced to various areas in the UK from the late 1880s through the 1920s. They are now wreaking havoc throughout the UK producing widespread severe debarking of woodland and landscape trees and threatening biodiversity; gray squirrels have caused regional extinctions of their native red squirrel (S. vulgaris). Consequently, much of the research aimed at explaining why gray squirrels strip bark has been conducted in the UK. Until recently, reasons posited on both sides of the Atlantic for the odd behavior ranged from reasonable hypotheses such as feeding on the sugar-rich phloem, searching for a water source, gnawing on trees to wear down ever-growing incisors, to the bizarre such as pregnant female squirrels gnawing bark in response to their pain. However, a paper published in February, 2016, provides a helpful literature review as well as a synthesis of findings in support of a newly emerging explanation known as the "Calcium Hypothesis" (see “More Information” below to access the entire paper). The authors do a nice job of building the case that bark stripping by gray squirrels is driven by their need for calcium at a time of the year when this essential nutrient is in short supply through available food sources; from April through July. Citing past research, they note it is well documented that gray squirrels will gnaw on calcium rich sources such as bones, antlers, and even limestone. They also show that debarking is most common after a good mast year supports an elevated population of juvenile squirrels in need of calcium to build bone as well as post-pregnant females in need of replacing lost calcium during pregnancy and nursing. Finally, they link the need for calcium by squirrels to the elevated levels of available calcium in tree phloem in the spring to early summer. The authors state, "Calcium can increase in the phloem by as much as 40% in trees in Spring and Summer after Winter dormancy, as it is required for growth." Indeed, it appears that squirrels may "taste test" trees prior to stripping bark as shown in the photo below. I've provided a very short overview of this interesting paper. As noted by the authors, the exact reasons behind bark stripping by squirrels may vary from location to location. They also stress that more research must be done to truly pin down the reason(s) for this odd behavior in the UK. This research caveat also applies to our side of the Atlantic. I could find no recent North American published studies that provide more than highly speculative explanations for squirrel bark stripping. Perhaps readers are aware of more rigorous scientific studies and will send me online links and/or citations. Until then, we are left with our own devices for providing creative but highly speculative explanations for this odd squirrel behavior. If you see debarking damage by squirrels, please e-mail me the location as well as the tree species. If you see the squirrel pictured above ... run.